Since fall is officially here (yes, I’m a little late to the party) cue the fall fashion posts! Maybe I’ll find a photographer & do some actual outfit posts. Anyone in the Lansing area?? Growing up, my mom always bought me silver jewelry and I was subconsciously biased against gold. As rose gold jewelry gained in popularity, I started trying out gold. I absolutely love the way gold looks mixed with neutrals. One of my wardrobe staples is a simple v-neck sweater in lots of different colors. Find the perfect sweater & buy 5. I’m not kidding. I love the sweaters from Target – they’re cheap and chic, what could be better? 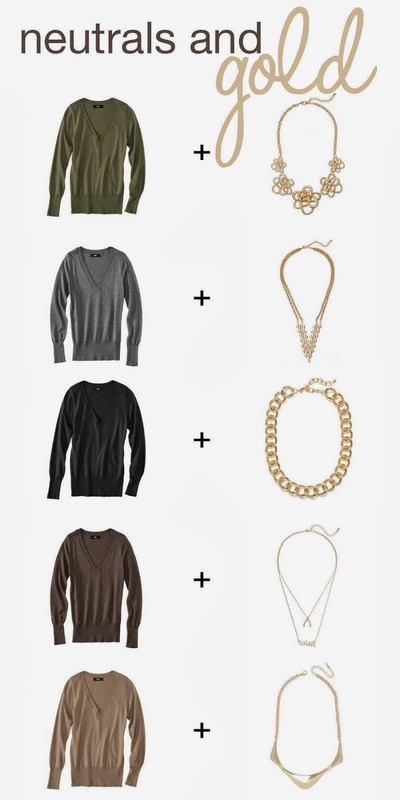 My favorite combination for fall this year is a neutral sweater and gold necklace. Jeweliq has the cutest necklaces (and all jewelry for that matter) under $25! I had to resist buying almost everything looking for necklaces! What’s your fall wardrobe staple?